WASHINGTON (CNS) — Nigerian native Lillian Ekwosi of Lanham, Md., didn’t mind staying awake all night to witness the canonizations of Sts. John XXIII and John Paul II in a Northeast Washington shrine. When she spoke with Catholic News Service on Divine Mercy Sunday April 27, Ekwosi said she was running on “spiritual energy” from spending nearly 24 hours in the St. John Paul II National Shrine with other Catholics to witness such a momentous occasion via television. In addition to the two late popes becoming saints in that time period, the name of the building also changed from Blessed John Paul II National Shrine to St. John Paul II National Shrine, and spectators cheered as members of the Knights of Columbus peeled away the old sign outside to reveal the new name of the cultural center and worship site. “It’s a historic day for the church, of course, but it’s also a historic day here at the John Paul II shrine,” said Patrick Kelly, executive director of the Knights of Columbus-run shrine. The Polish pope’s canonization led to the need to change the name of the facility, dedicated to the work and memory of the St. John Paul, Kelly told CNS. People started gathering at the shrine the afternoon of April 26. 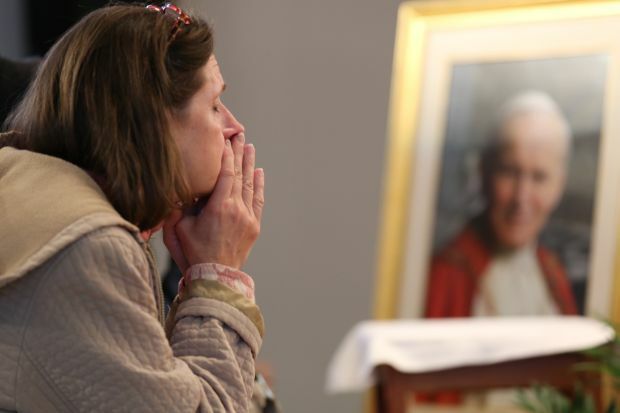 Throughout the night and into the next day, they had the opportunity to worship, pray, watch the canonizations via telecast, view exhibits on the life of St. John Paul and partake in Catholic fellowship. Though much of the focus at the shrine was on the new saint for whom it is named, the newly canonized St. John also was a discussion topic. “I’ve always been a great admirer of Pope John XXIII,” said Washington resident John Smeeton, a parishioner of the Basilica of the National Shrine of the Immaculate Conception. “I was in my youth when he was on the scene. Ekwosi admitted she had not known as much about St. John before the canonizations but found her time at the shrine to be an educational experience about the transformational pope. It is important to note that both of the newly canonized popes are linked, Kelly said. “These two men really shaped the face of Catholicism in the 20th and 21st centuries,” he said. “Of course, St. John XXIII called the Second Vatican Council, and St. John Paul II, who was an archbishop … at the council, took that and really took the message of the church, the message of the council … as he traveled all over the world” during his long papacy. Both Ekwosi and Smeeton told CNS their overnight stay at the shrine provided them with the opportunity to learn more about the lives and pontificates of the two new saints through the exhibits, literature and discussions with staff and other Catholics. It is the biggest event the Knights of Columbus have held at the shrine since taking it over a few years ago, and the organization plans to launch a major exhibit of St. John Paul in July, Kelly said.